If you want to just cut to the chase, then here’s the video – there are gaps between sessions as we refuel and natter, but skip along a few minutes and we’ll get back to business soon enough. There were three sessions spanning the evening, covering a varying selection and level of botframework and cognitive services content. The first session started with us all overcoming some technical difficulties – the Just Eat system works great if you’re presenting from the one PC that’s wired up to the AV system, but plugging another laptop is was proving very tricky! We got around it by starting a Google Meet (nee Hangout) on the presentation PC and having Jamie connect as the presenter from his laptop. Phew. Luckily the pizza arrived perfectly timed to cover this technical blip! Jamie works as a technical evangelist in the UK, helping customers and partners develop solutions based on the Microsoft platform. He really is as old as he looks, with over 20 years’ experience as a Microsoft software developer. He is passionate about Application Lifecycle Management, developer tooling, DevOps and creating new experiences using Microsoft technologies in the cloud. He has a degree from the university of life and once read some books! 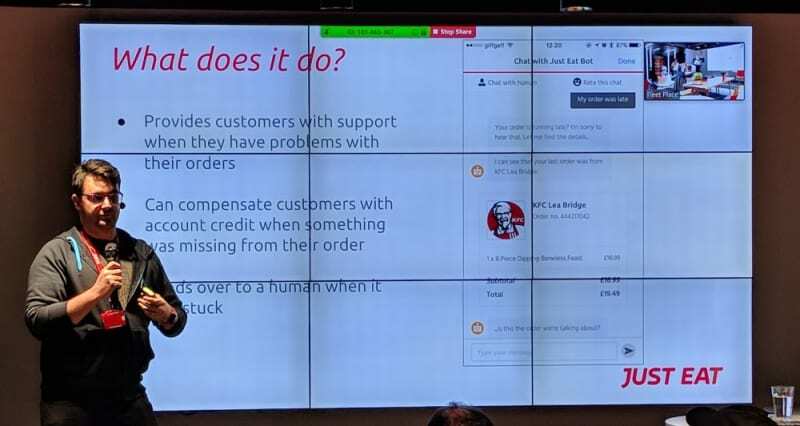 I had first seen Jamie’s solution via a twitter link of a video where he shows a Skype client and a Slack client both connecting to a Bot Framework chatbot and asking to be transferred to a human, which has a UI for all currently connected chats; this was inspirational to me at the time, as I was working on the Just Eat customer help chatbot which needed to hand over to a human help agent in various scenarios. Could it use this solution? 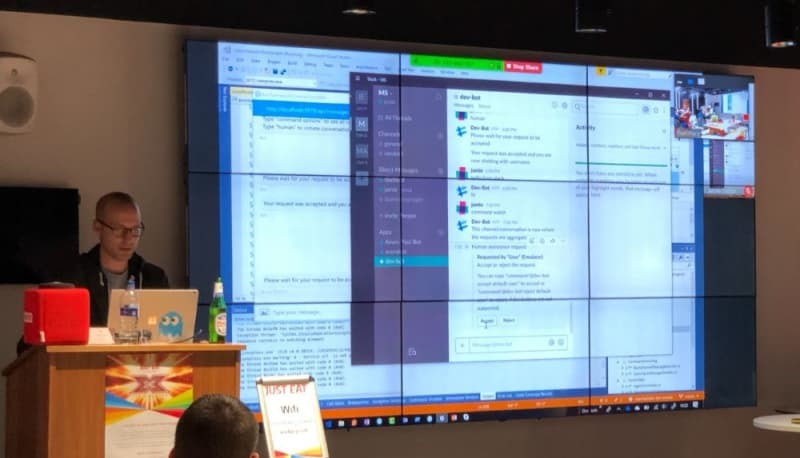 The filling in this botframework session sandwich was my own session about the fantastic Speaker Recognition API from the Microsoft Cognitive Services. I talked about some of the incredible offerings from Cognitive Services, then gave a potentially chaotic live demo of the Speaker Verification and Speaker Identification APIs! Kristian Brimble and Sam Kavanagh from the Just Eat Help Chatbot dev team took us through the Just Eat chatbot testing process, referring to the classic test pyramid approach. 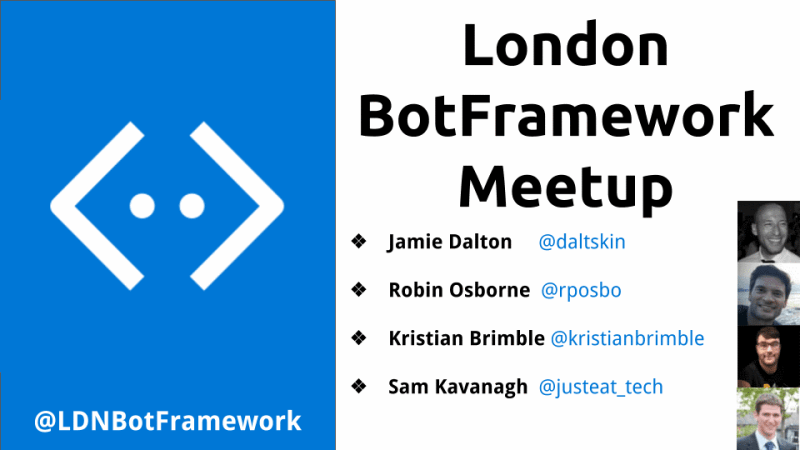 A fork of the BotFramework Emulator which allows you to set the port on which it listens, and exposes that in the title bar, meaning you can now orchestrate the bot emulator! Another fantastic meetup from my perspective; the JustEat meetup space is great, as is their beer and pizza. The recorded video even has embedded camera footage of the speaker, so you feel like you’re in the room (or at least, on a live video stream!) which I found added a lot to the video. I’m looking forwards to the next one, hopefully in January.